My stand up paddle story begins on a chicken farm in Northwest Arkansas, where I grew up. I went to college and then on to Wall St. Firm after firm, city after city, I eventually settled in Southern California. I was tired of finance and finance was tired of me. I tried a lot of different things that Los Angeles had to offer. I went to acting school. I went to film school. I drove a tour bus in Hollywood. I’ve been on over 200 episodes of Judge Judy as an audience member. I worked as a hot dog vendor on Hollywood Blvd. I even became a helicopter flight instructor. It was late 2003. After seeing the movie “Riding Giants,” it seemed like a good idea to become a surfer, as I lived near an ocean. The weekend warrior guy didn’t appeal to me. I wanted to surf giant waves…and I wanted to be a pro…with sponsors. With very little ocean experience and no previous surfing experience, I went to Surfrider Beach in Malibu armed with a 9’6″ longboard, bar of wax and a wetsuit. I suited up and paddled out. First, there is one thing you need to understand, I’m a male from the South…Southern men believe they are experts in all things sport. I was no exception to this rule. That day was one of the most embarrassing, exhausting and humbling experiences I’ve ever had. I tried and tried and could not figure it out the mechanics of catching a wave. I was too stupid and too proud to take a lesson. It was a near drowning experience that made me re-assess this new undertaking and wasn’t too long before I had an epiphany. Back at Surfrider Beach, I saw the big-wave master Laird Hamilton himself for the very first time, live and in-person. It was unreal! He was standing up on this very large surfboard and with no effort, he caught waves with the assistance of what looked like a boat oar. I’d never seen anything like this before. 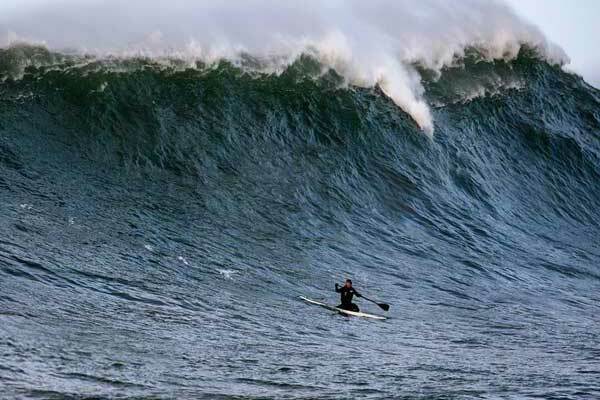 Laird was the star of “Riding Giants” and he was a big-wave surfer. It quickly became apparent to me that this style of riding waves was something that I needed to figure out. I ran to Action Water Sports in Marina del Rey and bought the very first stand up paddleboard that came through their door. I couldn’t afford an official stand up paddle, so I used a double-ended kayak paddle and sawed off one of the blades. And thus began my training for giant waves. Fast forward a few years, my wife had a friend who wanted to try stand-up paddleboarding and knew it was something we both did. After a bit of instruction, she was up and paddling in the Marina…and like most who try it, she was instantly hooked. I was a newly certificated helicopter flight instructor at the time, but couldn’t get students due to the financial crash of 2007. I was parking cars at the Chart House. A week later, the paddling friend called and convinced me to offer this paddleboard experience to the subscribers of her website. It seemed like a fun opportunity at a time when nothing else was moving forward in my flying career. Launching our product on her site entailed setting up a website, creating a curriculum of sorts, coming up with prices – essentially setting up a business. I scoured the internet looking for surf schools who offered such services, so I could find a template to copy. No such thing existed. Our little stand-up paddleboard school was the very first in California, Hawaii or anywhere else. The day that our “offer” went live on my wife’s friend’s website, we sold 400 lessons. It kept me busy for a whole summer and before you knew it, we were in business. 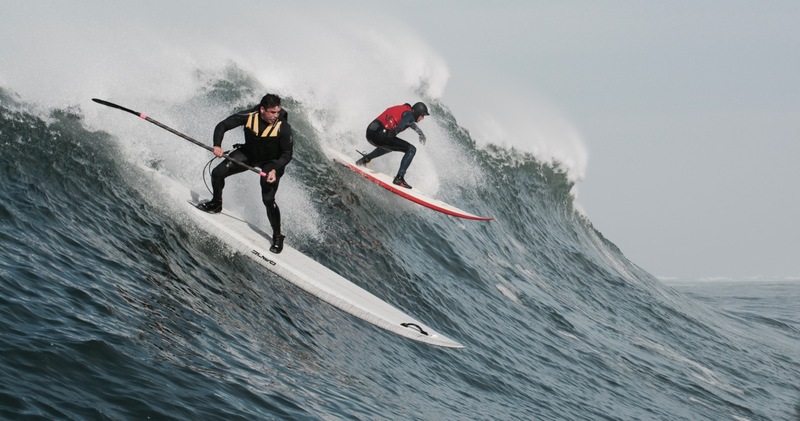 It wasn’t long until SUP schools started popping up everywhere. Meanwhile, running a SUP school has allowed me to constantly enjoy time on the water and hone my paddle stroke, which has allowed me to follow my true passion. In the pursuit of giant waves, I’ve managed to work myself into the lineup at the biggest spots on the West Coast, including Todos Santos, Spooner’s Cove, Maverick’s, spots we don’t dare mention, Nelscott Reef, etc. 2017 will be the second year that I’ve qualified for the Nelscott Reef Big Wave Invitational, competing against some of the best surfers in the world. So, here it is… my whole point to this. Because of my exploits, lack of formal instruction and numerous trips to the ER, I have inadvertently gained a lifetime’s worth of surfing knowledge, in just a few years. All of this, because of Stand Up Paddling. So…go to my lessons page and buy a lesson. You’ll like it. Los Angeles Magazine article from Nathan Deuel. Nelscott Reef Big Wave Unvitational 2016 – Wade Lawson advances to compete in the invitational pro SUP event.